Imagine maneuvering swift tricks in a kayak, crawling through a narrow tunnel, or climbing a rock wall. Now imagine executing each activity while harnessed to a cable high in the canopy of a mammoth oak. North Carolina’s first full-scale aerial adventure park opens this month near downtown Asheville, and features 50 obstacles that mimic the outdoor sports for which this area is known. Think of the urban treetop course as a twist on a traditional high ropes course; only this one’s on steroids and includes ziplines. 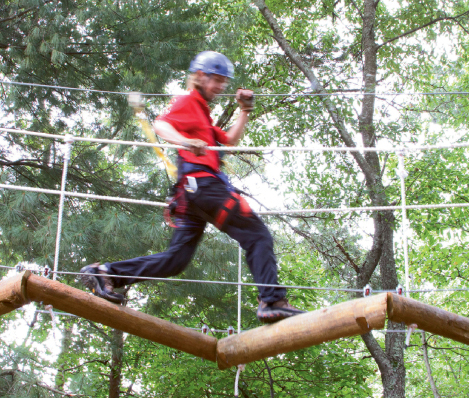 Modeled after similar attractions throughout Europe, Asheville Treetops Adventure Park is the brainchild of adventure mogul Jeff Greiner, co-owner of Asheville Zipline Canopy Adventures, in partnership with Wildwater Ltd. The best part for thrill seekers, says Greiner’s business partner Wells Lowery, is you create your own route by choosing from four tree-based “trails” that range in difficulty. Advances in safety technology allow you to tackle the course without a guide and at your own pace. Lowery says participants can repeat their favorite obstacles or progress “to push your personal fitness bar and really feel a sense of accomplishment.” The king-size jungle gym makes an ideal family adventure, says Lowery, or just a thrilling way to explore the canopy.